The IBM is one of the two main magic associations in the U.S. with the S.A.M. (Society of American Magicians). Omar Pasha is part of the show : “International Stars of Magic” on July 4th. What a fearsome honor to act in front of 1400 congress participants, colleagues and friends. What can we say about it ? Our good friend Gaetan Bloom, also taking part in this show, has the best description : “We, the Frenchies, are not that bad : those guys got the two only standing ovations of the evening”. Unfortunately, our good friends Carol and Marvin Roy (Mr Electric) are not able to join the Convention, as Carol just had back surgery. But we have a long chat by phone. from United States : Jay Scott Berry, James Dimmare, Kevin James, Chuck Jones, Irene Larsen, Milt Larsen, Lupé, John Moehring (as Magic Magazine representative), Norm Nielsen, “Obie” O’Brien, Dale Salwak, David Sandy, Rick Thomas, and so on, and so on. 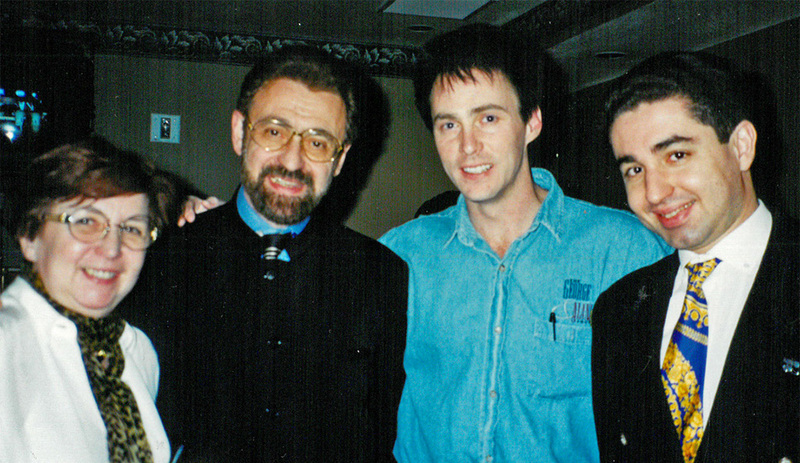 And all those we had at last the privilege to meet : the young and nice Darren Romeo, who is presenting in 2002 the new afternoon show at the “Mirage“ in Las Vegas, on the Siegfried and Roy’s stage, and so many others as : Mr Carl Ballantine, legend of US comedy magic, and Stephen Bargatze, Lev Bergeron, Rich Bloch, John Carney, Todd Charles, Steve Dacri, Robert Fitch, Davey Marlin-Jones, Alan Shaxon, David Stone, Steven & Michelle Valenti, and so on. We are illusionists, but unfortunately we are not able to split in two ! What a shame, as the other Convention, the one from the S.A.M. 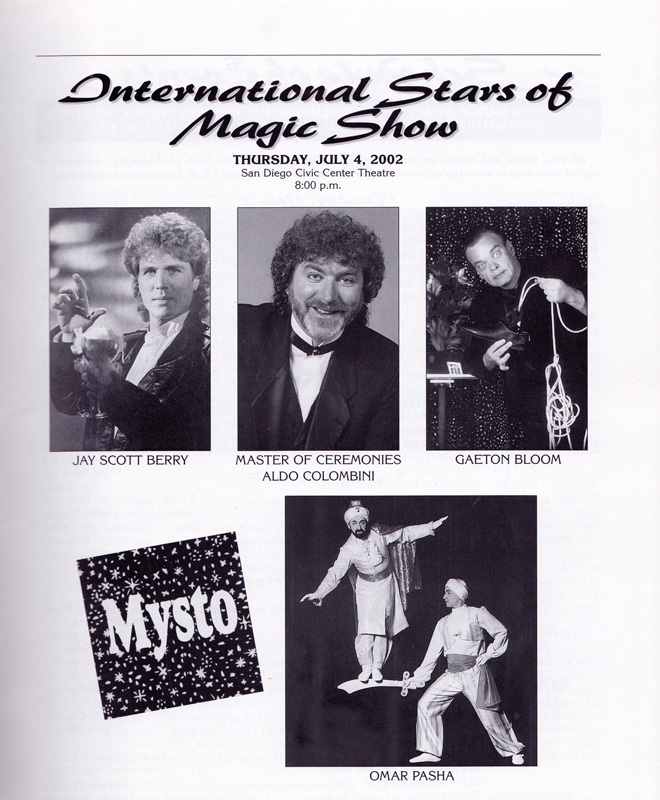 (Society of American Magicians) is held at the same time in New-York. And there are over there in NY an other whole crowd of dear friends and colleagues. On the way back home, and before flying from Los Angeles to Paris, we rent a car, driving for a few days to Las Vegas before to reach the L.A. airport. Thank you very much to our good friend Michel Fontaine to welcome us in his Henderson’s house. We see again the never sleeping city of Las Vegas and we see as much shows as possible during this short stay. After intermission we were treated to a return of a great old act : Omar Pasha. It was a hit. Gaetan Bloom and Omar Pasha both stopped the show. 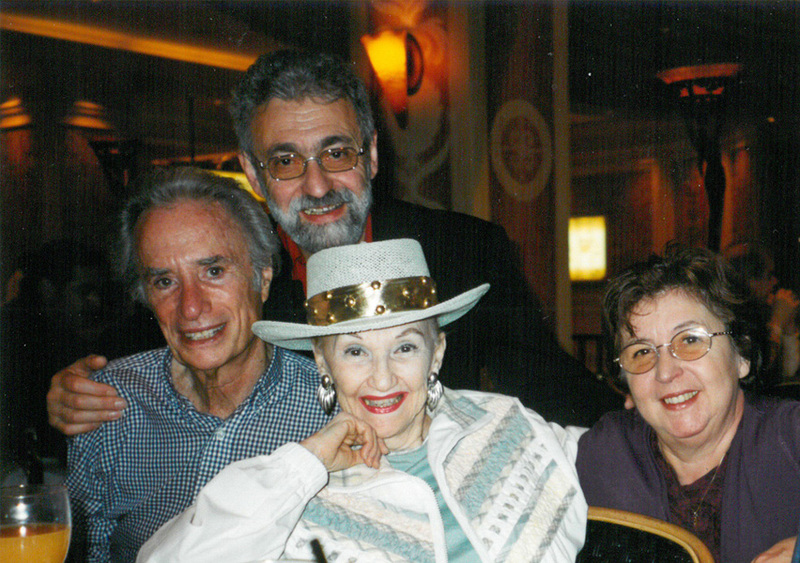 *Bev Bergeron, actor and magician, born in 1930, is one of the great comedy magicians in the United States.